Bailey Nelson Continues Rapid Canadian Expansion: Aussie eyewear retailer Bailey Nelson, known for its interesting designs and reasonable prices, opened its second Toronto location last week at CF Toronto Eaton Centre. The 1,400 square foot retail space reflects an updated store design for Bailey Nelson. Bailey Nelson’s first Toronto location opened in November of 2017 on trendy Queen Street West. The company’s cross-Canada expansion has been rapid. Soon, it will have five storefronts in Vancouver. In Alberta, Bailey Nelson has two stores in Calgary and two in Edmonton, including a recent opening at West Edmonton Mall. Bailey Nelson was founded in 2012 in Bondi Beach, outside of Sydney, and now has stores in Australia, the UK, Canada and New Zealand. Vancouver-based Peregrine, which is one of Canada’s largest retail display and millwork manufacturers, was involved in building the ‘new look’ CF Toronto Eaton Centre unit as well as several other locations (with more to come). Peregrine design-engineered and manufactured store fixtures including cabinetry, community tables, POS stations as well as custom-made framed mirrors and a modular custom peg wall panel. Cabinets with sliding doors are unique in that the doors are hung only on the upper track, so that hardware systems cannot be seen from the outside. It’s part of the store’s clean and simplified aesthetic. The store’s peg wall integrates a modular fixture to the store’s interior, allowing for flexible product display. Peregrine also manufactured the display shelves with built-in LED illumination, display tables and the POS desks in the attractive new retail space. Bailey Nelson plans to operate about 50 stores in Canada over the next three years or so, with store designs similar to the new CF Toronto Eaton Centre location. Dans un Jardin to be Saved by Groupe Marie Claire: Back in November 2018, popular Quebec-based body product retailer, Dans un Jardin, announced its declaration of bankruptcy due to “insurmountable financial difficulties”. Dans un Jardin began the liquidation and insolvency process under the Bankruptcy and Insolvency Act with Richter Consulting Group Inc. Now in 2019, it looks like Dans un Jardin may bloom again thanks to the intervention of another Quebec retail group, Groupe Marie Claire. President of Groupe Marie Claire, Sylvain Lafrance, said that the announcement of Dans un Jardin’s closure has incited ‘sympathy’ among its customers. Shareholders may be swayed to resume operations following an increase in sales from the announcement. The revival of the brand will see 15 stores as well as an e-commerce platform. The company will oversee the redesign of their concept but will not stray far from the natural ingredients and fragrances that made it a Quebec institution. Dans un Jardin had 55 stores and 600 points of sale across Quebec and the rest of Canada at the time of closing. The company also maintained a manufacturing facility in Boucherville, Montérégie. Dans un Jardin’s head office will be relocated to Groupe Marie Claire’s grounds in the Anjou area of Montreal. Lululemon Launches Post-Workout Beauty Range: Vancouver-based athleisure giant, Lululemon, has announced the launch of their “Selfcare” skincare range. The collection features four products that will help you transition from workout to workday: aluminum free deodorant, dry shampoo, basic balm, and a facial moisturizer. Lululemon “Selfcare” is set to launch in late spring, according to their website. Lululemon states that the line was built around insights gathered from the athletes in their communities. They worked with industry-leading product developers to build proprietary formulas that focus on: function, feel, and format. Each product features effective ingredients, pleasant scents and textures, and practical packaging. The products will be cruelty-free and made without gluten, parabens, and sulfates. Based on an examination of the ingredient lists for each product, the formulations are not vegan-friendly. “Selfcare” is not the first line of beauty products designed for active lifestyles; Clinique launched CliniqueFIT in 2017 which is more focused on cosmetics rather than body and hair products like “Selfcare”. A collection of skin and hygiene products designed for post-workout use is a logical brand extension of Lululemon; it is surprising they are only moving into the beauty world now. This new facet of the business may have been accelerated by the naming of Calvin MacDonald, formerly President and CEO of beauty juggernaut Sephora, as the new CEO of Lululemon. Though the launch may seem late for Lululemon, the timing is culturally appropriate given the rise of the self-care movement, encouraging people to take time for themselves to make sure they are mentally and physically taken care of. Similar to how people feel about their fitness routines, beauty-enthusiasts often feel the same way about their skincare routines. Lululemon is intelligently linking the two avid consumers groups together. Michaels Crafts Launches Unique ‘Community Classroom’ Concepts: Michaels has found a creative way to repurpose their existing in-store classrooms at their 1200+ locations in Canada and the United States. “Community Classroom” was piloted in six test markets in late 2018 and Michaels is ready to expand the concept company-wide, including Canadian stores. Instructors can establish their own schedules, curriculum, and class prices all while hosting the course at their local Michaels store. “As an experiential business, this is yet another example of the innovative approach that supports the importance of locally driven curriculum and encourages creatives to consider Michaels classrooms as their own,” Steve Carlotti, The Michaels Companies’ executive vice president of marketing, said in a statement. To help in the roll-out of the “Community Classroom” concept, Michaels has partnered with software company, AnyRoad, to bring the experience to their customers. AnyRoad’s Experience Relationship Management Program will provide Michaels real-time analytics to help them maintain the makerspace program. The intention behind the program is to foster a sense of community amongst the Makers at Michaels. Carlotti believes the program will allow the retailer to offer on-trend courses that will attract the attention of each local market and bring them to stores. Creating a greater sense of community seems to be a trend amongst retailers. Retail Insider reported on the opening of Staples’ first “Working, Learning & Growing” store in January of this year. Staples designed this new store to become a coworking space as well as a learning hub that focuses on personal and professional growth. As both retailers provide customers with tools and solutions to refine their skills and expand their offerings, it is logical that both would take a community-based approach to evolving their businesses. Retail Insider will continue to observe the shift to community-powered retail experiences. CF Toronto Eaton Centre Canadian Tire Store to be Renovated: The 85,580 square foot Canadian Tire store at CF Toronto Eaton Centre will see a renovation to be completed by the spring of 2020, according to a post in the Urban Toronto Forum. 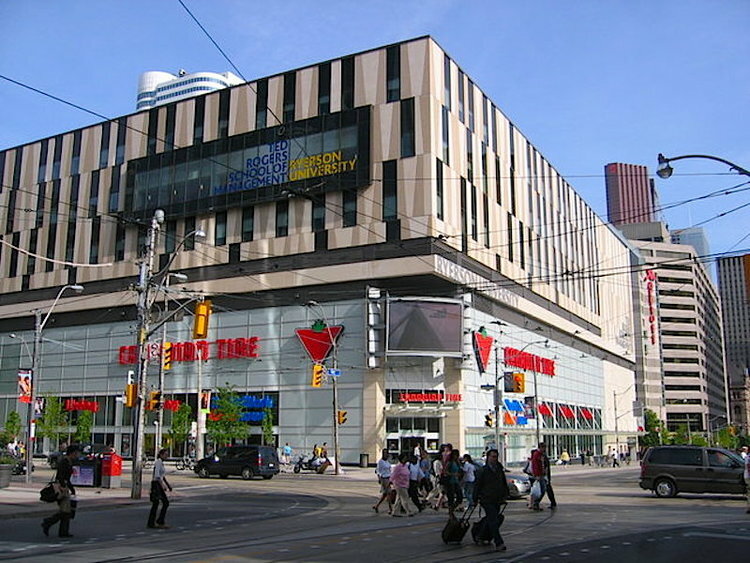 The store is directly below Ryerson University’s Ted Rogers School of Management. The interior will be renovated to the ‘new look’ standard which appears to be more upscale than a traditional Canadian Tire store. The store’e exterior is also expected to see minor changes. The store is under new ownership — some Canadian Tire stores are corporately owned, while others are franchises. The CF Toronto Eaton Centre Canadian Tire renovation is being modelled on the prototype South Edmonton Common store, which opened in the summer of 2015. Units across the country have seen similar renovations, including the flagship store on Yonge Street just north of Church Street (across from the Masonic Hall), as well as a large store in the Leslie Street/Lake Shore Boulevard area east of Toronto’s downtown. An updated store will open in Liberty Village next spring. The South Edmonton Common Canadian Tire was the largest in Canada at nearly 140,000 square feet over two floors when it opened. On March 21 of this year, its title of ‘largest’ was overthrown with the opening of a 173,000 square foot unit in the city of Grande Prairie, Alberta.